Nearest: Railway Station: London Kings Cross 140 yards (128 metres), Tube Station: King"s Cross St Pancras 0.09 miles (0.1 km), DLR Station: Tower Gateway 2.5 miles (4 km), Motorway: M1 Junction 1 5.4 miles (8.7 km). Great local rail links via 3 network rail (mainline overground) and 4 underground (tube) stations within a half mile (0.8 km) circle of the hotel. Opposite both St Pancras and Kings Cross stations (just 300 metres) the Crestfield Hotel is well located for commuters. Kings Cross is a commercial area but close to the tourist areas of London. St Pancras is the terminus for the Eurostar train service to Paris. The British Library is within walking distance as is Bloomsbury. A few minutes by taxi would see you in Covent Garden and the West End. Other nearest attractions include Regents Park, British Museum, Camden Market and Madame Taussauds. The Crestfield Hotel hotel building dates back to 1840. Rooms can accommodate up to 4 where specified. Room facilities include Tea/coffee maker and satellite TV. Ensuite where specified and Ironing board/iron and hairdryer available from reception. Ironing board/iron and hairdryer available from reception. 40 of the 52 rooms are en-suite. The basic rooms that are not en-suite have a toilet just outside the room. The breakfast room is where a daily continental breakfast is served which consists of a Fruit Salad, Toast, Cereals, Tea/Coffee, Hot Chocolate, Orange Juice and Apple Juice. Served 07.00 till 09.00. Onsite the hotel offers a fully licensed bar (open 24 hours), internet access, luggage storage, lounge, safety deposit box and front desk. 24 hour front reception. Value for money 2 star accommodation. Compared to other London hotels: This hotel has been rated 77% by past guests. The London average is 80% and the average for 2 star hotels is 68%. Therefore while the hotel is below the overall London average you should note that this hotel is well above average for its sector (star rating) . Milesfaster ranking: 570th from 866 London hotels, and 16th of 70 two star rated hotels. Another to Consider: A comparable type of hotel close by (2.3 miles, 3.7 km) would be the 2 star Wardonia Hotel, with base rates beginning from £76 and which has a 74% guest satisfaction rating. We can also suggest a cheaper options nearby which would be the Travelodge Central Bank. 0.5 miles from the Crestfield Hotel (0.8 km), has scored 80% from former guests and has rates from around £49. Howabout selecting an alternative hotel by its higher guest rating? In that case the 3 Star Motel One Tower Hill may be one too look at. The Motel One Tower Hill is only 0.2 miles (0.3 km) away. A highly rated hotel with a guest score of 90%. 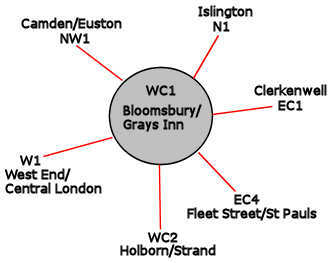 The 50 hotels nearest to this location (2-4 Crestfield Street, WC1 postcode) that we list cover a 0.7 miles (1.1 km) radius. They breakdown as follows: 3 five star hotels (average rating 89%), 17 four star hotels (average rating 82%), 20 three star hotels (average rating 76%), 8 two star hotels (average rating 71%) and 2 one star hotels (average rating 62%). Top 2 star hotels are Crestfield Hotel (this hotel) and the Generator Hotel (both 77%). Overall the best rated hotel is Montague On The Gardens Hotel (4 star) at 99%. Base Rates: A look at how hotels compare for starting rates (base rates). These published rates are long term rates so do not take account of special deals and offers. The average starting rate looking at all the nearest hotels to this location is £96 per night. The cheapest standard rates begin at £16 at Generator Hotel (2 Star, 77%) while the highest base rates are £222 at Renaissance St Pancras (5 Star, 89%). Averages listed for each individual star sector: Five Star average: £193, Four Star average: £119, Three Star average: £85, Two Star average: £47 and One Star average: £53. Our in-house ranking based on guest ratings but adjusted for influencing factors ranks Crestfield Hotel 30th (joint) of the 50 local hotels and 1st (joint) for the 8 two star hotels in the area. 15th of 50 (7th of 8 two star hotels.) for base rates ranking. Scoring the hotels rates and review score together we rank the hotel 15th of 42 when judging value for money (Generator Hotel was top).